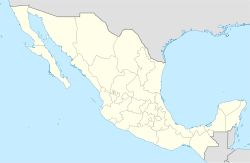 Matamoros, officially known as Heroica Matamoros, is a city in the northeastern Mexican state of Tamaulipas. It is located on the southern bank of the Rio Grande, directly across the border from Brownsville, Texas, in the United States. Matamoros is the second largest city in the state of Tamaulipas. As of 2016, Matamoros had a population of 520,367. In addition, the Matamoros–Brownsville Metropolitan Area has a population of 1,387,985, making it the 4th largest metropolitan area on the Mexico–US border. Matamoros is the 39th largest city in Mexico and anchors the second largest metropolitan area in Tamaulipas. Municipal Palace in Matamoros, Tamaulipas (Mexico). Matamoros is one of the fastest growing cities in Mexico, and has one of the fastest growing economies in the country. The economy of the city is significantly based on its international trade with the United States through the NAFTA agreement, and it is home to one of the most promising industrial sectors in Mexico, mainly due to the presence of maquiladoras. In Matamoros, the automotive industry hosts the assembly and accessories plants for brands such as General Motors, Ford, Chrysler, BMW, and Mercedes Benz. Prior to the growth of the maquiladoras in the 2000s, Matamoros' economy had historically been principally based on agriculture, since northern Mexico's biggest irrigation zones are in the municipality. PEMEX announced a multi-billion offshore drilling project for the port of Matamoros, one of the future prospects for Mexico's oil industry. Matamoros is a major historical site, the site of several battles and events of the Mexican War of Independence, the Mexican Revolution, the Texas Revolution, the Mexican–American War, the American Civil War, and the French Intervention that allowed the city to earn its title of Undefeated, Loyal, and Heroic. The Mexican National Anthem was played for the first time in public at The Opera Theatre in Matamoros. Matamoros has a semi-arid climate, with mild winters, and hot, humid summers. Matamoros and Brownsville, Texas are home to the Charro Days and Sombrero Festival, two-nation fiestas that commemorate the heritage of the U.S. and Mexico which are celebrated every February. After that victory, the state congress granted Matamoros the title of "Heroic", countersigned by the Mexican Congress. Matamoros is to the rebellion west of the Mississippi what New York is to the United States—its great commercial and financial center, feeding and clothing the rebellion, arming and equipping, furnishing it materials of war and a specie basis of circulation that has almost displaced Confederate paper ... The entire Confederate Government is greatly sustained by resources from this port. Matamoros is home to more than 122 maquiladoras dedicated in its majority to export to the United States. This industry produces technological goods like cables, electrical appliances, electrical components, vehicle parts and accessories, textiles, chemical products, machinery, and computer products. The city operates about 35% of the Tamaulipas' maquiladora industry, placing second, just behind Reynosa. In December 2004, the maquiladora industry gave employment to more than 52,777 workers in Matamoros, which showed an increase of 576 jobs compared to 2003, formulating a 60% increase in employment. This economic activity is the second most important in the city of Matamoros, generating approximately 13.5% of the total employment in the municipality. The rapid growths of the population in Matamoros, along with an increase in incomes, have amplified the demand of satisfiers in the area. In the whole state of Tamaulipas, Matamoros places first in terms of jobs and businesses generated by foreign investment in the area, summing a total of 238 companies, 36% of the state's whole business sector. The municipality of Matamoros is within the Rio Grande river basin, and by means of irrigation, the agricultural sector flourishes in production. [vague][quantify] The two main water suppliers are the Rio Grande and the Arroyo del Tigre, which have dams that irrigate the region. Bagdad Beach (Playa Bagdad), also known as Lauro Villar Beach, is 27 km (17 mi) east of Matamoros, about 20 minutes in trajectory. At Playa Bagdad, important fishing tournaments are held each year, where participants from all over the state of Tamaulipas get together. During Holy Week, the beach experiences an abundant presence of visitors, primarily from Nuevo León, when Playa Bagdad becomes the host of several concerts, sport tournaments, and festivals. In 2014, the mayor Leticia Salazar proposed to change the beach's name to Costa Azul, in reference to a song of the Matamoros-native Rigo Tovar. In 1985, during the yearly festival of 'Festival del Mar,' Rigo Tovar, along with other important attractions, played in Playa Bagdad. Other second tier bands like 'La Firma', 'La Mira de Linares,' and 'La Leyenda,' along with several other pop groups, have also played during the month of April, the most visited period of the year. In addition, Playa Bagdad has several seafood restaurants. Jet ski, surfing, and even motocross and off-road 4x4 racing are allowed with few area restrictions. In a single day during summer breaks, the number of visitors can get as high as 180,000. Fortress of Casamata, converted into Museum Casamata in 1970, was a bastion that now guards a fine collection of prehispanic figurines and artifacts dating from central historic moments: the Spanish colonist era, the Mexican War of Independence, and the contentious Mexican Revolution. Unique and curious items are also exhibited, such as an iron casket where the remains of fearless General Canales once rested (fought against both American and French invasions) and the dark tunnels lounged beneath the construction, inevitable reference for local horror stories. The existence of a multipurpose hall and newspaper library also provide extra interest to the museum. The museum was founded by Don Eliseo Paredes Manzano, the city's first "cronista" and recognized historian. The 'Museo de Arte Contemporáneo de Tamaulipas (MACT),' inaugurated in 1969, is largest and most important art museum in the city, and one of the most memorable in the state of Tamaulipas. Art and photo exhibitions are held yearlong at MACT. Artworks from Mexico City, Monterrey, New York City, Los Angeles, Milan, and Paris have been displayed at this museum. The central 'plaza' in Matamoros is home to the Presidential Offices, the Cathedral of Nuestra Señora Villa del Refugio, and of the Casino Matamorense, along with other historical buildings. The 'Teatro Reforma', the most important theater in the city, is found a few blocks away. On 28 January 1829, the plaza was named after the heroic and historical figure Miguel Hidalgo y Costilla, who fought in the Mexican War of Independence. Moreover, the Cathedral of Nuestra Señora Villa del Refugio, constructed in 1831, was one of the first mayor constructions and is one of the present symbols of the city. Its neoclassical architecture, along with its rich, historical background, attracts visitors yearlong. The Casino Matamorense, constructed in 1950, is traditionally considered the center of social gatherings for the principal families of Matamoros. Also with its unique architecture, Centro Cultural Olimpico, is a historical creation built in the city. Nothing like it had been done before. And finally, the 'Teatro Reforma,' once considered the 'House of the Opera of the 19th Century', was constructed in 1861. For decades, the theater was home to important balls held by the richest families of Matamoros and the high-ranking military officers of the state. In addition, 'Teatro Reforma' is well known for being the first place in history where the Mexican National Anthem was played. The city of Matamoros has a warm humid subtropical climate (Köppen climate classification Cfa), with mild winters, and hot, humid summers. Its proximity to the Gulf of Mexico accompanies cooler winds during the summers and winters, compared to its sister cities of Reynosa and Nuevo Laredo, which are farther inland. Moreover, the climate of Matamoros is subtropical, with relatively low precipitation patterns distributed throughout the summer, and with summer temperatures ranging from 30 to 40 °C (86 to 104 °F). Temperatures above 38 °C (100.4 °F) are very uncommon, just as the other extreme, where freezing temperatures during the winter are rarely seen as well. While on average the warmest month is August, the March record high shows influence from the tropical wet and dry climates located further south in Mexico where the temperatures soar to their yearly maximums in March and April before decreasing somewhat during the rainy season. Heavy rainfall is usually seen during the months of July and August, although it is not uncommon to go about without any rain whatsoever during the "wet" season. The average temperatures during the winters usually range around 0–10 °C (32 to 50 °F); this seasons is usually attended with rain, drizzle, and fog. The last snowfall was seen on 25 December 2004, which is the greatest snowfall ever recorded in the city, with up to 3.8 cm (1.5 in) in one day. Despite its proximity to the humid Gulf Coast, the city is dry, receiving an average of 698 mm (27.48 in) of precipitation annually. Brownsville & Matamoros International Bridge (B&M): It is popularly known as the "Old Bridge" or "Puente Viejo", because of its original incarnation in 1904. Gateway International Bridge: Popularly known as the "New Bridge" or "Puente Nuevo." This bridge is located in downtown Matamoros, Mexico and Brownsville, Texas, just a block away from the University of Texas at Brownsville. It is the most used international bridge for pedestrian crossings in the city. Veterans International Bridge: Commonly known as "Los Tomates Bridge", this gateway is the largest and newest bridge in the Brownsville-Matamoros metropolitan area. Free Trade International Bridge: Commonly known as Los Indios Bridge, this international bridge crosses the Rio Grande, connecting the United States-Mexico border cities of Los Indios, Texas and Matamoros, Tamaulipas. Manuel González Flores (1833–1893): Military soldier and politician, who also served as President of Mexico. He also played important roles in the French Intervention and in the Reform War with Benito Juárez. Pedro Hinojosa (1820–1903): Former military officer and politician, who served as governor of Coahuila, Nuevo León, and Chihuahua; played vital roles in the French Intervention, in the Mexican–American War, and in the Reform War. Lauro Villar Ochoa (1865–1913): Mexican general who defended Francisco I. Madero during La Decena Trágica. Gregorio Cortez (1875–1916): Mexican American outlaw in the American Old West who became a folk hero to Mexicans living in South Texas. Rigo Tovar (1946–2005): Cumbia singer who is considered the musical pioneer of fusing electric guitars, synthesizers and rock melody with traditional Mexican music. Carlos Cascos (born 1952): Incoming Secretary of State of Texas, former county judge in Cameron County, Texas, born in Matamors, naturalized American citizen. Carlos de los Cobos (born 1958): Former soccer player and current manager who played in Club América and in C.F. Monterrey while also participating in the World Cup '86. Cristina Rivera Garza (born 1964) is a Mexican writer who won the prestigious Sor Juana Inés de la Cruz Prize in 2001 and 2009, becoming the first writer to win the prize twice. Raúl Gárate Legleú [es] (1896–1977): Military general and former governor of Tamaulipas; named police chief of Mexico City in 1920 and Subsecretary of National Defense of Mexico in 1947. Guadalupe Mainero (1856–1912): lawyer, journalist, and governor of Tamaulipas in 1896. In addition, he served as the President of the Supreme Court in Mexico in 1888. Adalberto J. Argüelles (1850–1923): professor, member of parliament, and served as director of the Educación Federal, La Sociedad Benefactora, and as member of Alianza Obrera Progresista. 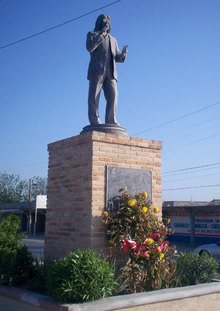 Eliseo Paredes Manzano (1899–1988): businessman and journalist who served as mayor of Matamoros. He was the founder of Crédito Industrial de Monterrey and of Asociación de Charros, treasurer of Comité Pro-Educación local, director of Cruz Roja, president of Club Rotario, and commander of Tercer Batallón Regional de la Defensa Civil. Carlos Quintero Lamar (1863–1933): Former lawyer and diplomat who studied in Tulane University. He later served as consul in the country of Costa Rica and in New Orleans, U.S.
Raúl Brindis (born 1963): Mexican radio personality. ^ "División Municipal" (in Spanish). INEGI. ^ "Implan Matamoros". Archived from the original on 27 March 2012. Retrieved 19 June 2011. ^ "Matamoros, Mexico: U.S. Consulate Hours". U.S. Consulate in Matamoros, Mexico. Archived from the original on 31 August 2011. Retrieved 1 September 2011. ^ Carranza, Rafael (9 March 2011). "Mexico's census reveals mix numbers for Tamaulipas border". Action 4 News. Retrieved 19 June 2011. ^ "Estadísticas INEGI Población en Matamoros". Copyright 2011 matamoros.com. Archived from the original on 1 September 2011. Retrieved 29 June 2011. ^ "World Gazetter: America – Largest Cities". Archived from the original on 1 October 2007. ^ "Tamaulipas". Comision de salud fronteriza: Mexico – Estados Unidos. Archived from the original on 31 March 2012. Retrieved 1 September 2011. ^ Parry, Sam (19 March 2001). "Nothing Is Free About Free Trade". The Consortium. Retrieved 3 November 2011. ^ "Mexico: Matamoros". Arkema. Archived from the original on 10 May 2012. Retrieved 3 November 2011. ^ Brandon, Karen (27 March 2001). "Nafta Tries To Fill Hole in Mexico". Chicago Tribune. Retrieved 3 November 2011. ^ "Agglomeration economies and urban manufacturing growth in the northern border cities of Mexico" (PDF). El Colegio de la Frontera Norte. Archived from the original (PDF) on 8 November 2011. Retrieved 3 November 2011. ^ Mendoza, Arturo Alvarado (1983–2009). "Trabajo y organización gremial en Matamoros". Estudios Sociológicos: El Colegio de México. 1–27. JSTOR 40420236. ^ "Tamaulipas' Economy". Explorando Mexico. Retrieved 3 November 2011. ^ "FDI and Export-Performance Requirements" (PDF). Institute of International Economics. Retrieved 3 November 2011. ^ "Matamoros, Tamaulipas, Mexico" (PDF). United States Environmental Protection Agency. Retrieved 3 November 2011. ^ Walsh, Casy. "Infrastructures of Irrigated Agriculture in the Mexico-U.S. Borderlands" (PDF). Universidad Iberoamericana. Retrieved 3 November 2011. ^ "Recibirá fuerte impulso el puerto de Matamoros". El Diaro de Ciudad Victoria. Retrieved 28 November 2011. ^ "Buscan atraer más apoyos de Pemex para Matamoros". HoraCero. Archived from the original on 7 April 2012. Retrieved 28 November 2011. ^ "Condiciona Pemex construir el Puerto". Expreso. Archived from the original on 3 May 2012. Retrieved 28 November 2011. ^ "Tamaulipas y la guerra de Independencia: acontecimientos, actores y escenarios" (PDF). Gobierno del Estado de Tamaulipas. Archived from the original (PDF) on 25 April 2012. Retrieved 4 November 2011. ^ "The Mexican Revolution: Conflict in Matamoros". University of Texas at Austin. Retrieved 3 November 2011. ^ Scribner, John. "The Texas Navy". Texas Military Forces Museum. Retrieved 4 November 2011. ^ Delaney, Robert W. (5 April 1995). Matamoros, Port for Texas during the Civil War. Texas State Historical Association. p. 487. ISSN 0038-478X. JSTOR 30241907. ^ Yorke Stevenson, Sara (2004). Maximilian in Mexico A Woman's Reminiscences of the French Intervention 1862 To 1867. Kessinger Publishing. p. 168. ISBN 9781419133299. ^ "Matamoros: "Eres Invicta y Leal, Matamoros Heróica"". Tamaulipas: En Linea. Archived from the original on 25 April 2012. Retrieved 3 November 2011. ^ "A los matamorenses nos distingue la entereza, el patriotismo y la valentía": ASG". Hoy Tamaulipas | Noticias. Retrieved 20 November 2011. ^ "Tamaulipas". History.com. Retrieved 4 November 2011. ^ Rodríguez Esteves, Juan Manuel. "Desastres asociados a fenómenos climáticos en la frontera México‐Estados Unidos" (PDF). El Colegio de la Frontera Norte. Archived from the original (PDF) on 21 March 2012. Retrieved 3 November 2011. ^ "Charro Days: A Tradition". Charro Days Fiesta Organization. Retrieved 6 November 2011. ^ "Sombrero Festival 2012". Sombrero Festival Ltd. Retrieved 6 November 2011. ^ "Tamaulipas – History". History.com. ^ "Veracruz History". Explorando Mexico. ^ a b "Enciclopedia de los Municipios de México ESTADO DE TAMAULIPAS". Archived from the original on 3 June 2007. Retrieved 24 June 2011. ^ Rendón de la Garza, Clemente. "Vidas Ilustres". University of Texas at Brownsville. Archived from the original on 7 January 2005. ^ "MATAMOROS – La Gran Puerta de Mexico". Archived from the original on 4 October 2011. Retrieved 24 June 2011. ^ Treviño, Oscar. "Mi Matamoros Querido". Periódico El Bravo. ^ Matamoros. Sección Amarilla. p. 388. ^ Roell, Craig H. "MATAMOROS EXPEDITION OF 1835–36". Texas State Historical Association. ^ "Matamoros Heróica". Gobierno Municipal de Matamoros. Archived from the original on 27 September 2011. Retrieved 24 June 2011. ^ Dávila Gómez, Alfonso. "Breve Historia de Matamoros". ^ "Matamoros". Destinos Aeroméxico : Matamoros. ^ Boullosa, Carmen. "La oro blanco en Tamaulipas". El Universal. ^ Congressional edition, 2667. Washington: United States Congress. 1889. ^ Craig H., Roell. "MATAMOROS EXPEDITION OF 1835–36". Handbook of Texas Online. Texas State Historical Association. Retrieved 16 December 2011. ^ Delaney, Robert W. (1955). Matamoros, Port for Texas during the Civil War. Texas State Historical Association. p. 487. ISSN 0038-478X. JSTOR 30241907. ^ a b The War of the Rebellion: a Compilation of the Official Records of the Union and Confederate Armies. Washington: United States. War Dept. 1880–1901. JSTOR 30241907. ^ Underwood, Rodman L. (2008). Waters of Discord: The Union Blockade of Texas During the Civil War. McFarland. p. 200. ISBN 9780786437764. ^ "Matamoros". New Orleans Times. 1 June 1865. JSTOR 30241907. ^ "New York Herald". 9 January 1865. JSTOR 30241907. ^ "The Southwestern Historical Quarterly". New Orleans Daily True Delta. 16 December 1864. ^ Official Records of the War of the Rebellion. Washington: United States Department of War. 1894–1922. JSTOR 30241907. ^ Henry, Robert S. (22 August 1989). The State of the Confederacy. New York: Da Capo Paperback. p. 342. JSTOR 30241907. ^ "Matamoros and Belize: "From powder and caps to a needle"". New Orleans Times. 12 November 1864. JSTOR 30241907. ^ Hanna, Alfred J. (May 1947). The Immigration Movement of the Intervention and Empire as Seen Through the Mexican Press. Duke University: The Hispanic American Historical Review. p. 246. JSTOR 2508417. ^ "Matamoros and New York: Heavy and profitable". New Orleans Era. 1 November 1864. JSTOR 30241907. ^ "Matamoros port: 30,000 inhabitants". New Orleans Times. 3 March 1865. JSTOR 30241907. ^ "Port of Matamoros: "gloom, despondency, and despair"". New York Herald. 17 March 1865. ^ "Port of Matamoros". New Orleans Times. 1 June 1865. JSTOR 30241907. ^ The Journal of Southern History. Southern Historical Association. November 1984. ISSN 0022-4642. JSTOR 2208496. ^ Schober, Otto. "Cuando el río Bravo era navegable". Zócalo Saltillo. ^ Beezley, William H. (2011). A Companion to Mexican History and Culture. John Wiley & Sons. p. 688. ISBN 1-4443-4057-3. ^ "Intervenciones de Francia en México" (PDF). Universidad Autónoma de México. ^ "Primer Reparto Agrario, Francisco J. Múgica y Lucio Blanco". Módulo IIA. Museo Del Agrarismo Mexicano. ^ "1948 to 1962: The Cotton Age". Ole Design Inc.
^ Lobatón Huerta, Guillermo. "Industria Maquiladora". Instituto Tecnológico de Monterrey C. Puebla. ^ "Maquiladoras de Matamoros". Gobierno Estatal de Matamoros. Archived from the original on 23 May 2007. Retrieved 24 June 2011. ^ "Comercio en Matamoros". Sitio de Internet de la Administración Municipal. Gobierno Municipal de Matamoros. Archived from the original on 27 September 2011. Retrieved 24 June 2011. ^ "Inversión Extranjera Directa". Gobierno Municipal de Matamoros. Archived from the original on 27 September 2011. Retrieved 24 June 2011. ^ "Pecuario". IMPLAN. Archived from the original on 27 March 2012. Retrieved 24 June 2011. ^ "Ganadería" (PDF). Matamoros en cifras: Análisis del desempeño socioeconómico 2005. IMPLAN. Archived from the original (PDF) on 27 March 2012. Retrieved 28 December 2018. ^ "Pesca y Comunidades Pesqueras". IMPLAN. Archived from the original on 27 March 2012. Retrieved 24 June 2011. ^ "Playa Bagdad". Gobierno Municipal de H. Matamoros. Archived from the original on 28 March 2012. Retrieved 4 August 2011. ^ Mariscos de la Rosa. "Rutas Tamaulipas: Playa Bagdad" (PDF). Revista Travesías. Archived from the original (PDF) on 30 September 2011. Retrieved 4 August 2011. ^ "Afinan detalles en playa Bagdad para Semana Santa". Milenio Noticias. 15 March 2011. Archived from the original on 15 October 2012. ^ Lozano, Agustín (23 January 2014). "Sólo una parte de la playa será 'Costa Azul' en Matamoros". Hora Cero (in Spanish). Archived from the original on 24 January 2014. Retrieved 24 January 2014. ^ "Festival del Mar: Matamoros 2011". Matamoros.com. Retrieved 4 August 2011. ^ "Matamoros Turístico". Gobierno Municipal de H. Matamoros. Archived from the original on 30 January 2008. Retrieved 4 August 2011. ^ "Museo Historico Casamata". Gobierno Municipal de H. Matamoros. Archived from the original on 28 March 2012. Retrieved 4 August 2011. 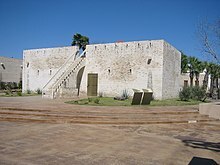 ^ "Presenta Museo Casamata "Revolución Mexicana en Matamoros"". Grupo Verbo Libre Editores | HoraCero. 22 November 2008. Archived from the original on 15 December 2010. Retrieved 4 August 2011. ^ "Museo Casamata". Gobierno Municipal de H. Matamoros. Archived from the original on 27 September 2011. Retrieved 4 August 2011. ^ "Museo de Arte Contemporáneo de Tamaulipas". Gobierno Municipal de H. Matamoros. Archived from the original on 27 September 2011. Retrieved 4 August 2011. ^ "Selección de exposiciones selectivas y colectivas". Museo de Arte Contemporáneo de Tamaulipas. Archived from the original on 28 March 2012. Retrieved 4 August 2011. ^ "Plaza Hidalgo". Matamoros: La Gran Puerta de México. Archived from the original on 4 October 2011. Retrieved 4 August 2011. ^ "Historia del Casino". CASINO MATAMORENSE, S.A. Retrieved 4 August 2011. ^ "Teatro Reforma". Matamoros.com. Retrieved 4 August 2011. ^ "NOWData – NOAA Online Weather Data". National Oceanic and Atmospheric Administration. Retrieved 11 February 2013. ^ "Climatological Information for Brownsville, United States". Hong Kong Observatory. Retrieved 11 February 2013. ^ "Puentes Internacionales". Gobierno Municipal de Matamoros. Archived from the original on 27 September 2011. Retrieved 25 June 2011. ^ "B&M Bridge". Texas Department of Transportation. ^ "Gateway International Bridge". Texas Department of Transportation. ^ "Veterans International Bridge at Los Tomates". Texas Department of Transportation. ^ "Free Trade Bridge (Los Indios Bridge)". Texas Department of Transportation. ^ "Manuel González". Instituto Nacional de Estudios Históricos de la Revoluciones en México. ^ Para Efectos de la Guerra (PDF). Gobierno del Estado de Nuevo León. pp. 1–255. ^ de la Garza, Ciro R. "Lauro Villar". Universidad Autónoma de Tamaulipas. Archived from the original on 27 March 2012. ^ Orozco, Cynthia E. "CORTEZ LIRA, GREGORIO". Texas State Historical Association. Retrieved 9 November 2011. ^ "Biografía de Rigo Tovar". Copyright 2011 Batanga. Archived from the original on 30 September 2011. Retrieved 25 June 2011. ^ Jonathan Tilove (11 November 2014). "Greg Abbott names Mexican-born county judge secretary of state". Austin American-Statesman. Retrieved 4 December 2014. ^ "Carlos de los Cobos". 2011 Medio Tiempo S.A. de C.V. Archived from the original on 4 August 2012. ^ Emanuel, Lynn. "Cristina Rivera-Garza". Summer 2003. Boston Review. ^ "Raúl Gárate Legleú". Nuevo Diccionario Biográfico de la Heroica Matamoros. Archived from the original on 27 March 2012. Retrieved 25 June 2011. ^ "Guadalupe Mainero Juárez". Universidad Autónoma de Tamaulipas. Archived from the original on 27 March 2012. Retrieved 25 June 2011. ^ Fidel Zorrila, Juan. "Adalberto J. Argüelles". Universidad Autónoma de Tamaulipas. Archived from the original on 27 March 2012. Retrieved 25 June 2011. ^ "Eliseo Paredes Manzano". Nuevo Diccionario Biográfico de la Heroica Matamoros. Archived from the original on 17 July 2012. Retrieved 25 June 2011. ^ "Carlos Quintero Lamar". Nuevo Diccionario Biográfico de la Heroica Matamoros. Archived from the original on 27 March 2012. Retrieved 25 June 2011. ^ "U.S./MEXICO SISTER CITIES: Brownsville/Matamoros" (PDF). Brownsville/Matamoros Cross Border Contingency Plan. Retrieved 2 August 2011. Wikimedia Commons has media related to Matamoros.